Speedy the tadpole is sad because he can’t sing along with the froggy chorus. However, one day strange things begin to happen to him as he starts to turn into a frog! With the help of his pond and garden friends, Speedy learns a few valuable lessons along the way. Croak! – a delightful musical for 3-7 year olds that explores the life cycle of a frog. Available with Words on Screen™ v2. This delightful new musical explores the life cycle of a frog through five catchy songs and three instrumental tracks. 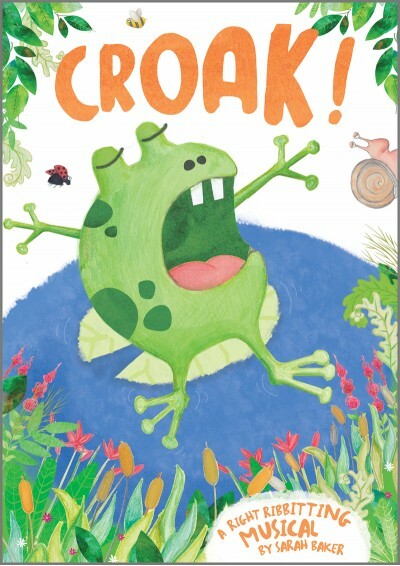 With a simple script and a positive message, Croak! is perfect for ages 3-7, so join Speedy and his friends and learn that we can all do something if we really try! The script has small speaking parts and lots of narration suitable for adults or older children and the five songs are catchy and fun to sing, making this production perfect for Early Years and Infants. There are seven speaking parts and two group-speaking parts (the frogs and insects/flowers say several lines in unison). However, these speaking parts can easily be increased by splitting the narrator's part into lots of small speaking parts.